CLICK IMAGE TO CONTACT US ABOUT YOUR FUNDRAISER! Is your group or organization looking for a creative way to raise money for equipment, a trip or a cause? Look no further than Pioneer Meats. 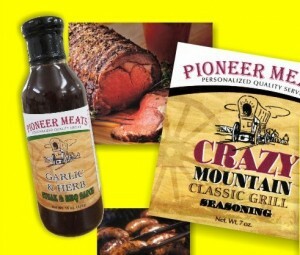 Whether your selling Shelf stable Pepper Stix, meat baskets or Garlic and Herb steak and BBQ sauce, these items are sure to be a hit for most any fund raising event. We have helped many FFA chapters and school organizations fulfill their fundraising in one event. Not only do we have products to sell, but want to hear your ideas of things you would like to try in your community. Hear what some of our customers have said about this great opportunity. “Best single fundraising event in the 16-year history of our organization.